Instead of decorating the outside, I decided to make the whole cake Hawks themed. Hawthorn’s colours are brown and gold (I won’t give you the colloquial name for them), and the player’s guenseys feature the colours in vertical stripes. 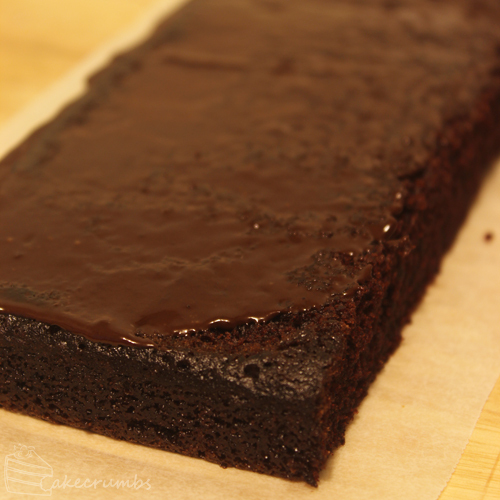 I started off with my favourite chocolate cake recipe, which is one of those accidentally vegan recipes. Sometimes I leave it vegan, and sometimes I throw in milk for the hell of it. 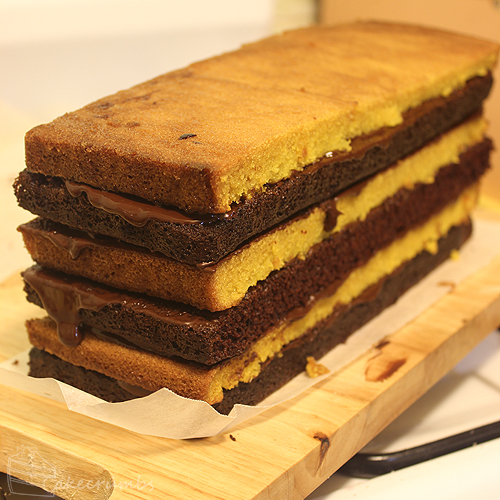 I baked it in a square 25cm cake tin, then cut it into three even strips. For the gold layer I left out the cocoa and subbed some of the sugar for banana Nesquik. I’d bought some of it a few weeks back as the banana variety is one of Cameron’s favourite things ever, so it seemed an obvious choice. This part was a total experiment on my part, so I was surprised by how flawlessly it worked. But the biggest surprised to us both was how the cake tasted exactly like banana cake. As in the traditional banana cake make with mashed up over-ripe bananas. I was expecting more of a fake/lolly banana flavour. This cake is about as simple as it gets to bake, and assembling is just as easy. The hardest part is just being gentle with the cakes. The recipe produces and incredibly moist mudcake that wants to crumble with slightest provocation. You need to gently handle, and not over-handle, the layers. But apart from that, it’s a cakewalk. Assembly is as simple as spreading on a layer of chocolate ganache, piling an opposite coloured layer on top, giving that layer the ganache treatment and comtinuiong until you run out of layers. 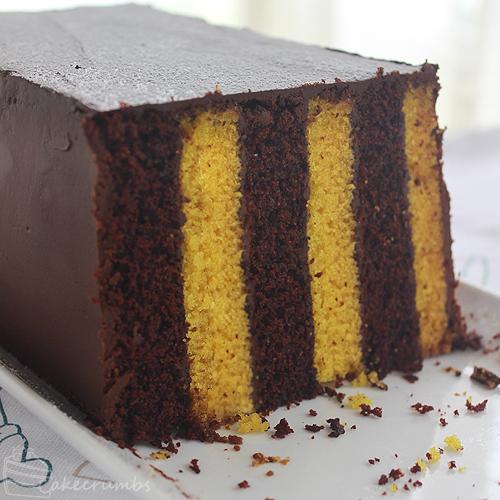 At this point it makes a nice bumblebee-looking cake. But I was after a Hawks effect, not bees, so I turned it over onto it’s other side. I trimmed off the edges partially for neatness, but mostly because I wanted to see how the layers had turned out. My main concern for the cake was the the chocolate would be too dark and/or the gold too pale, but the resultant cake was such a perfect match for Hawthorn colours. I couldn’t have planned it any better. That, however, didn’t stop me from constantly hounding Cameron over it for reassurance: “It looks like a guernsey, right? Do you think it looks like a guernsey? Are the stripes too thick? It’s the right shade, yeah? But when you look at it, does it scream Hawthorn guernsey?” Pretty sure he just wanted to eat it. For the outside, I had thoughts of making a logo or adding other decorations. But in the end I decided to go for a simple ganache. The inside was where the party was at, so I wanted it to look unassuming from the outside. I smoothed on a crumb coat, waiting for that to set then added another layer of it. when that had set, a dusted on a little icing sugar for contrast. Finally cutting it open was lots of fun. I had a good idea of what the layers looked like already, but it never really feels over until it’s time to cut into it proper. The cake was a complete hit with everyone, for both the flavour and the footy aesthetics inside. Whenever I use chocolate dark enough to be vegan, it’s too bitter for me. But even I had to confess to having no problems with it. Cake is really rich and sweet, so it countered how bitter the chocolate was. 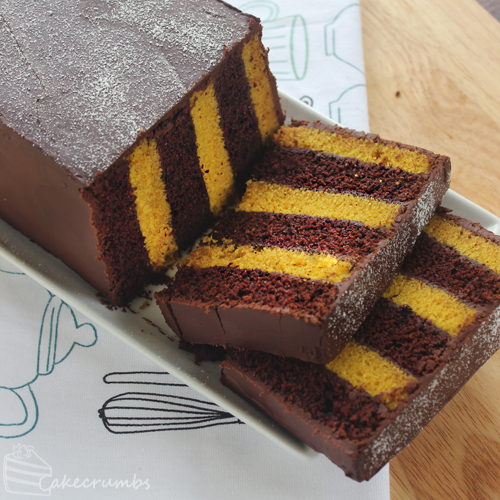 Cameron would later declare that the cake was what helped Hawthorn march to a convincing Grand Final victory. I’m not sure baked goods produce that amount of luck, but it certainly helped provide a distraction from the nerves as the match unfolded. The following recipe will provide you with both vegan and non-vegan options. Neither makes much discernible difference to the outcome of the cake. The ganache is a little richer with cream than milk, but both taste phenomenal. If you don’t want to buy Nesquik for the cake, you can sub in any banana flavoring. You could also try folding mushed up bananas through it if that’s the only option available to you. It will likely affect the rise of the cake, but that’s mostly guesswork on my part. Try it and see! Preheat oven to 180°C (160°C fan-forced/350°F). Line an approx 25x25cm cake tin or tray with baking paper. Pour batter into the cake tin and bake for 30-35 minutes, or until cake is well risen (it will bounce back when gently poked, or a skewer inserted into the middle will emerge clean). 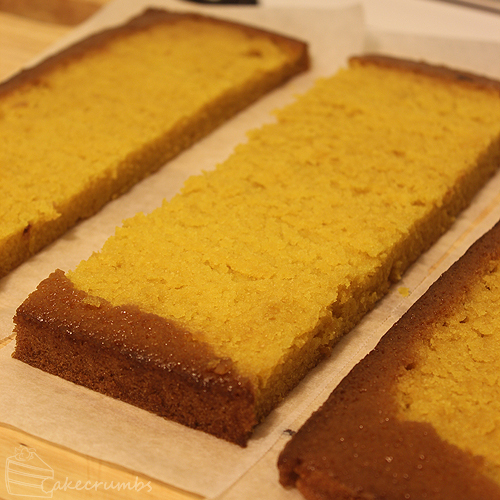 Cut the cooled cakes into three strips (mine were 8x24cm). Place one layer onto your work surface; spread a thin layer of chocolate ganache onto it, then top with an alternately coloured layer. 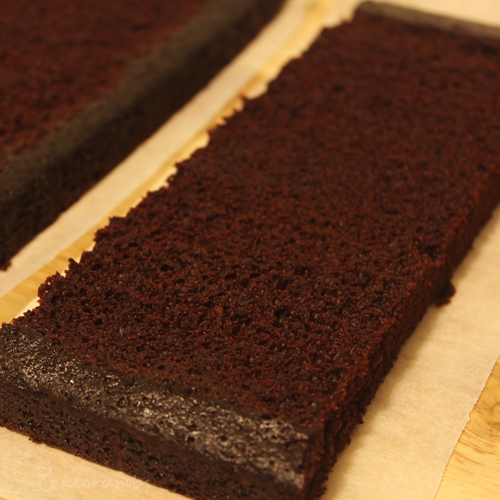 Spread ganache onto the surface of this next layer and repeat the process until you’ve used all the layers. 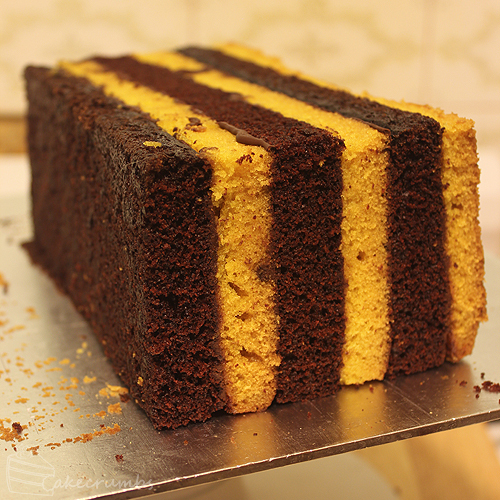 Turn the cake 90° so that the layers are now facing vertically. Trim the edged off the ends of the cake. 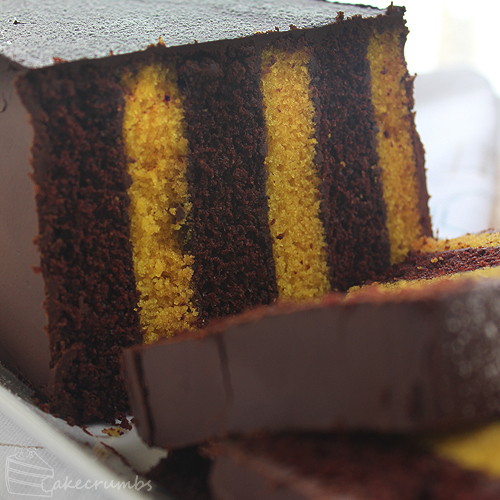 Cover the whole cake with a thin layer of ganache to act as a ‘crumb coat’. 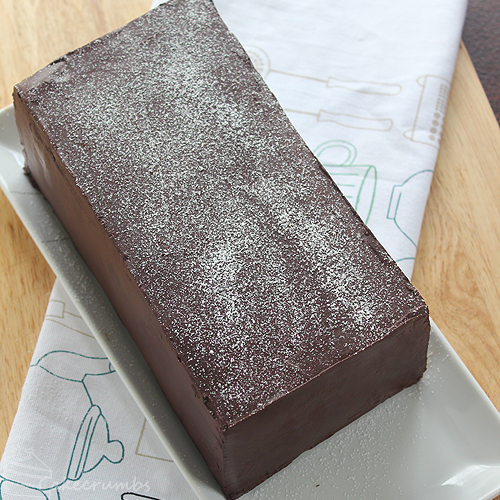 allow it to set, the ice with a final layer of ganache. Thanks for making this. Looked very impressive as a Hawks guernsey, and it definitely helped (at least a little bit) with the win. Yum!! I made the banana cake only as I’ve been searching high and low for a banana cake recipe that’s not like banana bread for the hubby. This one was a hit! I had to order the Nesquik from the UK (we’re in the US). Used chocolate buttercream for frosting. The bottom layer of the cake (one of the banana recipes above) was Nesquik only. The top layer was the recipe PLUS a very ripe banana. Hubby and guests liked the one WITH banana best, but both were very good. With a ripe banana it just rose less in the middle of the cake. That was no problem as it just made the cake flatter and easier to deal with. It seemed moister, but not more dense than, the recipe with no banana added. Just thought I’d let others know how it turned out with the banana in case anyone was curious. Excellent recipe. Love your blog!! That’s awesome 🙂 Thank you very much for your insight! Your English is wonderful! A million times better than any attempt at speaking German would be from me. Thank you for your lovely comment. ohh and i dont use banana nesquick, because its not cruelty free, what can i use as an alternative? Oh dear, I wasn’t aware of any cruelty issues with Nesquick. What’s the situation there? As for substitution I’m not aware of any similar flavoured powdery mixes, so you’d probably have to look at introducing the banana flavour other ways. You could use a liquid banana flavouring (usually available at cake decorating shops) or even just mash a banana in. Gonna try that! it’s simply and amazing! thank you for sharing! I made my best! really delicious! I noted too late that you used banana nesquick (which I haven’t) and not bananas (which I bought! ), so I opted for my usual banana bread recipe, and used some chocolate mousse instead of ganache! But the idea remains simply amazing and delicious! Every body loved it… And also I did! The day after is even better! Thank you for the idea, again! The recipe is coming soon on my blog too!